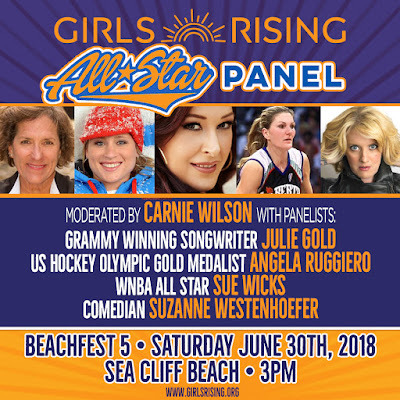 Girls Rising Announces All-Star Panel for BeachFest 5! Sea Cliff, NY - June 30, 2018 - All female rock band Antigone Rising will present their 5th annual BeachFest at Sea Cliff Beach Pavilion on Saturday June 30th from 12 noon - 10pm. BeachFest celebrates the work of the band's nonprofit, Girls Rising, which was officially formed in 2014. The centerpiece of the day revolves around a Girls Rising outreach panel discussion, much like the panel discussion the band presents at schools, universities, community centers, refugee camps, embassies and corporations around the globe. The only difference with this panel is that the women of Antigone Rising will step aside and let some of their friends take a turn sharing their stories of their paths to success. The All-Star panel consists of moderator, Carnie Wilson (5x Grammy nominee, member of Wilson Phillips, talk show host and Co-Founder/Entrepreneur of Love Bites by Carnie), with panelists, US Hockey Olympian Angela Ruggiero, WNBA All Star Sue Wicks, Grammy Winning Songwriter Julie Gold, and Comedian Suzanne Westenhoefer (Letterman/HBO/Logo). These game changing women will inspire everyone in attendance and empower the kids in the crowd to be anything they want to be. The panel discussion will take place at Sea Cliff Beach Pavilion, 52 The Blvd, Sea Cliff, NY at 3PM on Saturday, June 30, 2018. BeachFest 5 opens at 12 noon and is free to the public with a suggested donation at the entrance. Music begins at 12:30 with an all-star line up of female artists and vendors lining the beach. Antigone Rising will close the evening with a set of music scheduled to start around 8:15pm that evening.